«Let them give me a car and I’ll have the 16th, otherwise what’s the point of having more,» says Emma, a mother of 15 children who moved from Ashtarak with her family and resided in Azerbajian’s (formerly called) Lachin region in 1997. 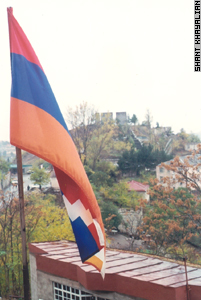 Emma’s 15th child, Artsakh, was born in 1998 in Kashatagh’s hospital. Emma and Sergey have six grandchildren. 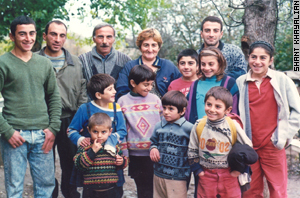 Their three daughters are married, two of them live in Ashtarak and third daughter lives in the neighboring village. «Our living conditions were very difficult. I was working in Ashtarak’s Institute of Radiophysics. The work had been stopped. Then I started to work in college. But there was no money there. Later Anahit persuaded me to come here,» says Sergey. During his second year in the village Sergey was given cattle credits and purchased two cows. They bred and in three years their number increased to five. He also has 10 sheep. He works in Berdzor (former Lachin city) in Capital Construction Department as carpenter-woodman, where he makes 35,000 drams (about $70). He also gets 15,000 drams of allowance for children. 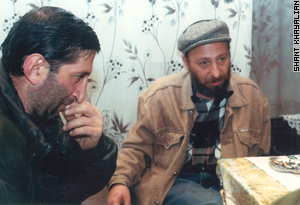 His wife is working as a cleaning woman in Goghtanik’s school, his son Gurgen is a watchman and he earns 6,000 Drams. The government of Karabakh still owes the family a car — as families with many children are entitled to a free car. Diplomats regard the 3000-square kilometer corridor as occupied territory, but Kashatagh’s officials regard it as liberated territory and they rename the settlements, either restoring their historical names or giving other Armenian names. 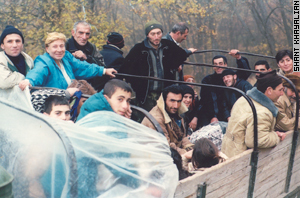 For the re-settlers Kashatagh is an escape from Armenia with the difference being that here they don’t become refugees but landowners. And it is only the officials who talk about the re-settlement as a patriotic action. For the new residents it is simply an opportunity to improve their living conditions. «If I say that I’ve come here to be a hero it won’t be true,» says director of Goghtanik village’s school Alik Tonoyan, who came from Baghramyan region’s Dalarik village, «my family consisting of seven people was hungry. Me and my wife were teachers in school but we hadn’t got enough money for bread. And now I help my parents from here. 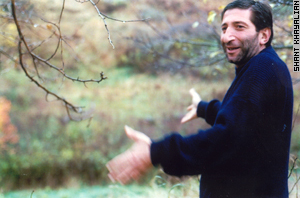 In the village there is the biggest water-supply in Alik’s house, where Azeri tractor driver Ali Mohammed, whose Communist Party card was found in the storeroom, lived before. Keeping an ample supply of water is symbolic for Alik, as in the village where he previously he had to pay 30 drams for a bucket of water. When the village school was first opened there were only seven pupils. Now there are 30. Villagers remember the day, when first child was born six years ago. That child’s umbilical cord was cut by the mother. The latest child was born in May of 2001. For the present moment there are 22 families (84 people) in the village. An abandoned Azerbaijani cemetery is at one of the village’s edges and at another edge there is an Armenian graveyard, where there are already four graves. His two sons are serving in the army. They were jobless in Yerevan and thanks to his wife’s persuasion they came here to be able to live. They were given a common single-room house, which is decorated with canvases hanging on walls and a library brought from Yerevan. The struggle with discomforts of their house is an opportunity to fill Hrach’s everyday life with work. Entry filed under: Features. Tags: Lachin.